Unlike many other cosmetics that have a history of hundreds or even thousands of years, nail polish (or lacquer, or enamel) is almost completely an invention of twentieth century technology. Nail coverings were not unknown in ancient times—the upper classes of ancient Egypt probably used henna to dye both hair and fingernails—but essentially, its composition, manufacture and handling reflect developments in modern chemical technology. Nail polish is made by combining nitrocellulose and plasticizers with color pigments. The mixing is done in a "two-roll" differential speed mill, which grinds the pigment between a pair of rollers that are able to work with increasing speed as the pigment is ground down. The goal is to produce fine dispersion of the color. plasticizer. Butyl stearate and acetate compounds are perhaps the most common. Finally, the polish must have a color. Early polishes used soluble dyes, but today's product contains pigments of one type or another. Choice of pigment and its ability to mix well with the solvent and other ingredients is essential to producing a good quality product. Nail polish is a "suspension" product, in which particles of color can only be held by the solvent for a relatively short period of time, rarely more than two or three years. Shaking a bottle of nail polish before use helps to restore settled particles to the suspension; a very old bottle of nail polish may have so much settled pigment that it can never be restored to the solvent. The problem of settling is perhaps the most difficult to be addressed in the manufacturing process. In addition to usual coloring pigments, other., color tones can be added depending upon the color, tone, and hue of the desired product. Micas (tiny reflective minerals), also used in lipsticks, are a common additive, as is "pearl" or "fish scale" essence. "Pearl" or "guanine" is literally made from small fish scales and skin, suitably cleaned, and mixed with solvents such as castor oil and butyl acetate. The guanine can also be mixed with gold, silver, and bronze tones. Once the pigment mass is prepared, it is mixed with solvent in a stainless steel kettle. The kettle has a water-jacket to facilitate cooling of the mixture. and unacceptable pigments change with new findings and reexaminations of colors, manufacturers occasionally have to reformulate a polish formula. Early methods of making nail polish used a variety of methods that today look charmingly amateurish. One common technique was to mix cleaned scraps of movie film and other cellulose with alcohol and castor oil and leave the mixture to soak overnight in a covered container. The mixture was then strained, colored, and perfumed. Though recognizable as nail polish, the product was far from what we have available today. The modern manufacturing process is a very sophisticated operation utilizing highly skilled workers, advanced machinery, and even robotics. Today's consumers expect a nail polish to apply smoothly, evenly, and easily; to set relatively quickly; and to be resistant to chipping and peeling. In addition, the polish should be dermatologically innocuous. 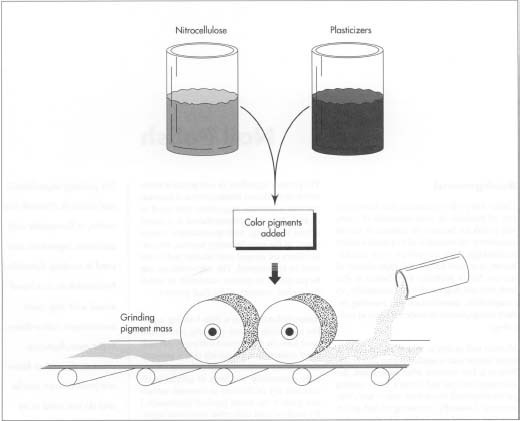 1 The pigments are mixed with nitrocellulose and plasticizer using a "two-roll" differential speed mill. This mill grinds the pigment between a pair of rollers that are able to work with increasing speed as the pigment is ground down. The goal is to produce fine dispersion of the color. A variation of this mill is the Banbury Mixer (used also in the production of rubber for rubber bands). Perhaps the major problem with nail polishes—from the consumer's point of view—is the length of the drying time. Various methods of producing fast-drying polish have recently been patented, and these methods, along with others that are still being developed, may result in marketable products. Of all the different types of cosmetics, nail polish is the one that is most likely to continue to be positively affected by advancements and developments in the chemistry field. Andrews, Edmund L. "Patents: A Nail Polish That Dries Fast." New York Times, March 7, 1992, p. 40. Andrews, Edmund L. "Patents: Quick-Dry Coating for Nail Polish." New York Times, June 13, 1992, p. 36. "Makeup Formulary." Cosmetics & Toiletries, April, 1986, pp. 103-22. Ikeda, T., T. Kobayashi, and C. Tanaka. 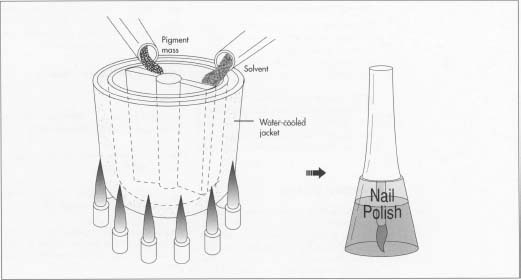 "Development of Highly Safe Nail Enamel." Cosmetics & Toiletries, April, 1988, pp. 59-60+. I am making a project of how to make nail polish, but i cant seem to find the exact ingriedients (the amount) of the chemicals i need. I need to make at least three different colours but i am finding it hard to find the amount of ingredients needed. So if you know that would be a great help.